Positive displacement flowmeters are truly a member of the class of traditional technology flowmeters. Their history goes back to 1815, when Samuel Clegg invented the first PD gas flowmeter. This was a water sealed rotating drum meter. Clegg’s son-in-law, John Malam, together with Samuel Crosley, invented an improved model in 1825. Problems remained, however, with high cost, freezing, and large size. Thomas Glover invented the first “dry” gas diaphragm meter in 1843. Glover’s meter contained two diaphragms and a sliding valve. In 1844, the first actual “dry” gas meter was developed by engineers Croll & Richards. The diaphragm meters used today are similar to these early meters, although major improvements have been made in material of construction. Early meters had diaphragms made of sheepskin with steel metal enclosures. 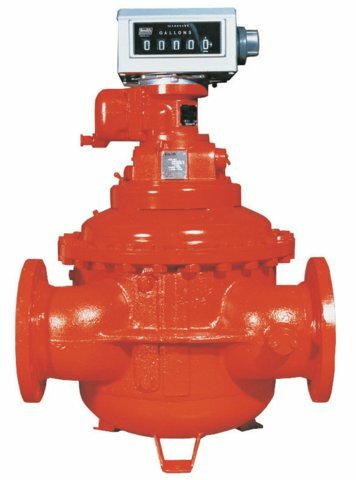 More recent meters have synthetic rubber-on-cloth diaphragms and are made of cast aluminum. Positive displacement (PD) meters are highly accurate meters used that are widely used for custody transfer applications. They are widely used for custody transfer of commercial and industrial water. They are also used for custody transfer of hydrocarbon liquids to and from delivery trucks. PD meters have the advantage that they have been approved by a number of regulatory bodies for this purpose, and they have not yet been displaced by other applications. PD meters are also used for custody transfer of natural gas. Bopp & Reuther of Germany holds the earliest patent for the oval gear meter in 1932. This meter has since been popularized by Oval Corporation of Japan , which introduced the oval gear meter in the early 1950s. Oval gear meters are used for liquid measurement.